As the groom of your upcoming wedding, have you made any final decisions on what kind of suit you’re going to wear? If this is your first wedding, you might think all wedding suits look the same. In truth, you’ll find numerous stylistic options to help you stand out from your male friends and family at the venue. Here are some things to think about for Men’s wedding suits for a Sydney wedding. One thing you should keep in mind first is your bride’s wedding dress is going to receive the most focus. Don’t wear something outlandish to try to upstage her fashion choice. Regardless, don’t think you can’t set a memorable fashion statement. Looking classy and appropriate to the venue is essential. You may discover picking your suit takes more time than actually wearing it. Even so, here’s some valuable tips to remember when shopping around. Almost all wedding fashion experts say you should buy your suit rather than rent. The reason is simple: Rented suits often look cheap and aren’t always tailored well. Remember, you’re not going to a high school prom. This is your wedding where you want to set the best possible impression and look your best in all the photography. Even if you never wear the suit much or ever again, consider the purchase of your suit an investment and part of your overall wedding budget. Going to a personal tailor is a great benefit since they’ll help make the suit you buy fit to your body shape. This might cost more money, but it’s worth it so you look as memorable as your bride. A regular fit might suit your style to give you more comfort over wearing something overly tight. Those of you with slightly larger body frames may prefer the regular fit option. You also have slim or tailored looks if you have a slimmer body. A tailored look gives you more movement so you don’t feel uncomfortable. It’s important to keep this in mind so you can easily dance at the wedding party when bringing in a Sydney wedding band or wedding singer. Working with your tailor helps you find the perfect suit fabric fitting the theme of your wedding. In most cases, the fabric you choose goes by the season so you feel more comfortable in warmer weather. Those of you planning your wedding for our upcoming Australian summer should perhaps go with linen to stay cooler. For winter, heavier fabrics like wool always look elegant. Cheaper fabrics like cotton and polyester also look good, so don’t think heavy fabrics are the only classy choice. Buying an appropriate tie, cuff-links, and even a watch helps personalise your accessories to fit your wedding theme. Don’t think these aren’t noticed by everyone, because they’ll be captured in photographs forever. 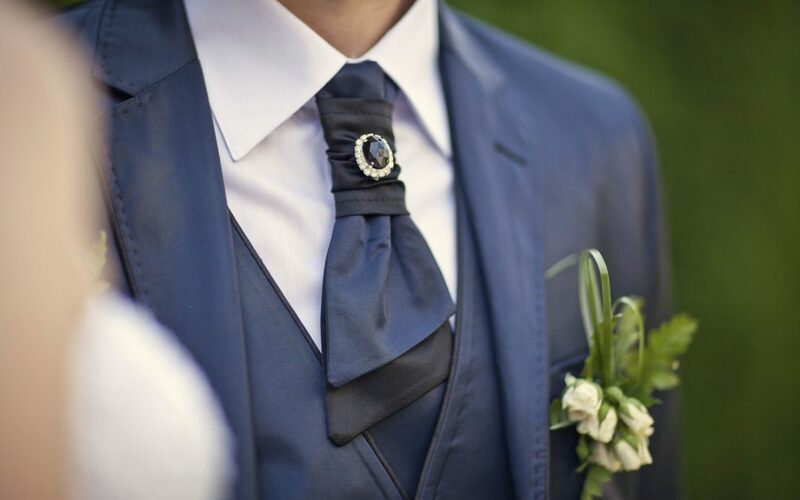 By working with a stylist, you’ll better choose the right accessories matching your suit. The perfect combination can potentially make you stand out from any other male in the venue. Don’t forget about how your suit matches with the wedding entertainment you hire. Since the wedding singers or band playing your party helps keep momentum going, does your suit represent the musical theme of the night? Maybe your wedding has a family heritage theme reflected in the music. Your suit could represent this particular ethnic heritage through fabric color and added accessories. Even a particular musical style can become incorporated into your suit. When you and your bride go out on the dance floor, you’re going to become the center of attention. With this in mind, the entertainment should fit the clothes you’re wearing to prevent awkwardness.